The Beijing-Shanghai high-speed railway has got the green light from the central government and construction on the long-awaited project is expected to start soon. According to a notice posted Tuesday on the website of the National Development and Reform Commission (NDRC), the top economic planner, the State Council accepted the feasibility study last month. No more details were given, except for the railway's length of 1,318 km. A source with the Ministry of Railways told China Daily that work on the project will "surely begin before the end of this year", without specifying a date. Earlier reports said the project would use high-speed wheel track technology instead of magnetic levitation. With a speed of up to 350 km per hour, the railway will shorten travel time between Beijing and Shanghai from the current 10 hours to less than five. The project has been on the drawing board for more than a decade with work expected to begin last year and be operational by 2010 - but was postponed. Insiders said the central government wanted to act cautiously on such a high-cost project. Shanghai-based China Business News earlier quoted insiders as saying that the railway ministry's initial estimation of 130 billion yuan ($17.3 billion) would not be enough; and estimated the figure could exceed 170 billion yuan ($22.6 billion) due to rising real estate prices and resettlement costs. Another report on China Economic Net (www.ce.net) quoted insiders as saying the project cost is likely to exceed more than 200 billion yuan ($26.6 billion), taking into consideration the increase in the price of raw materials and labor costs as well as other countries' expenditure on building high-speed railways. The mega project has attracted the attention of France's Alstom, Canada's Bombardier, Japan's Kawasaki Heavy Industries and Germany's Siemens, all vying to provide technology. It was not announced which technology will be used but Minister of Railways Liu Zhijun said last year that the ministry prefers using indigenous technology. Earlier reports quoted experts as saying the fare might be between 600 and 700 yuan ($80 to $93), about half the list price of an air ticket. 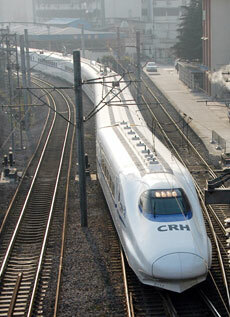 Currently, passengers pay 453 yuan ($60) for a seat, with the train running at a maximum speed of 250 kph.